The proposed new Constitution would uphold the provisions in the current Constitution to ensure that Buddhism is given foremost place and protected by State patronage, the Government informed Parliament yesterday. 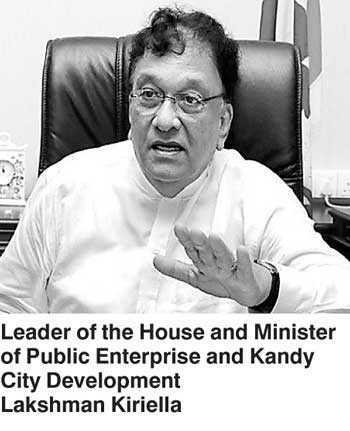 Leader of the House and Minister of Public Enterprise and Kandy City Development Lakshman Kiriella told Parliament that there would be no changes in the existing provisions pertaining to Buddhism in Sri Lanka when drafting the new Constitution. The Leader of the House made remarks in response to a question raised by Joint Opposition MP Udaya Gammanpila, who claimed the Government had omitted the clauses giving foremost place to Buddhism. “There have been attempts to remove Article 9 of the Constitution,” MP Gammanpila charged, referring to the clause in the Constitution that gives Buddhism prominence. Minister Kiriella criticised the Opposition for making baseless allegations, adding that the Government would soon be presenting the draft of the new Constitution to Parliament, enabling all to identify that no changes have been made to provisions regarding Buddhism. He went on to say that once the draft constitution is presented to Parliament, the Government would allocate at least three days for a debate in order to garner the views of all MPs on the legislation.